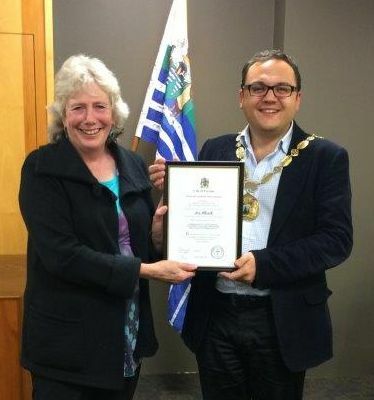 Joy Allcock was presented with a Mayoral Certificate of Recognition last month in recognition of her ‘Commitment to developing successful new solutions for education in Porirua City’. When presenting the certificate Mayor Leggett said that Mrs Allcock was a pioneer in reading and spelling initiatives for Porirua children. Joy has been involved in education in Porirua schools since 1988 when she was elected to the inaugural Pauatahanui School Board of Trustees when Tomorrow’s Schools came into being. While her children attended Pauatahanui School, Joy remained involved as a parent helper and Board member and she was also involved in the establishment of the Pauatahanui Preschool. After moving to Paremata, Joy was employed at Paremata School between 1994 and 1999. She was involved in a number of initiatives designed to enhance children’s learning. In 1997 she led the first trial of the Oticon Soundfield systems in a classroom at Paremata School. The success of this project led to a Ministry of Education Innovations Initiative which studied the effects of improving classroom acoustics on children’s learning over a three year period at Windley School. As a result of the findings from these two projects, other research has been carried out around NZ and these Soundfield systems are now used in thousands of classrooms, enhancing the learning environment and students’ literacy success, by improving acoustic conditions. In 1996 Joy began studying for a Master of Education degree through Massey University, graduating with first class honours 2000. Over this period she developed a school-wide approach to teaching spelling for Paremata School. She set up her own publishing company in 2000 and published her first book, Spelling Under Scrutiny, that year. Since then she has developed and published a wide range of literacy resources for teachers and children. 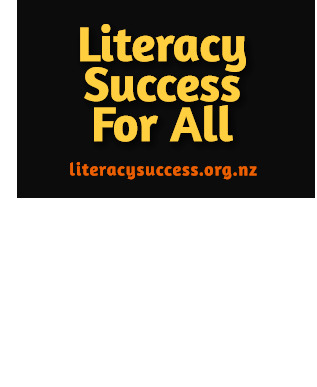 Between 2001 and 2004 Joy coordinated a successful three-year literacy enhancement project at Brandon Intermediate and Porirua College. At the end of this three-year project, 42.6% of Year 11 students at Porirua College achieved NCEA Level 1 passes, compared with 13.6% before the initiative. Between 2010 and 2012 Joy worked with Titahi Bay School trialling initiatives designed to enhance literacy instruction in the junior school. Over this three year period the school lifted the number of students achieving for reading from 60% to 90% and for writing from 49% to 82%. These results led to Massey University designing a larger, more robust study, the Shine Literacy Project, which has eighteen Porirua schools taking part and fourteen schools from outside Porirua. This project is evaluating an integrated approach to teaching literacy in the first two years at school. The project began in May 2014 and will run until May 2016. Early results are encouraging. You can read about these results here. In 2005 Joy was invited by the Ministry of Education to become a member of the National Literacy Reference Group which met annually for a number of years to discuss and advise on literacy instruction in NZ. She has also been providing teacher professional development since 2000 and has worked with teachers throughout New Zealand, in Australia, the US and Asia. She believes that all children have the potential to be successful and is committed to helping find ways to achieve this. Original generation time 1.5694 seconds. Cache Loaded in: 0.0291 seconds.